A highly-controlled study show that vaping pot delivers stronger effects than smoking it. Propensity score methods attempt to make observational data look like a randomized trial. But there are some big limitations that need to be considered before we jump on the bandwagon. For the video version, click here. I spoke with Yasmin Hurd, Professor of Neuroscience, Pharacology, and Psychiatry at the Icahn School of Medicine at Mt. Sinai about her research which suggests that the best way to beat the opioid epidemic, may lie within another illicit substance. Marijuana: Really a gateway drug? It's hard to figure out whether marijuana is a gateway drug, because those wet blanket bioethicists think it would be "wrong" to randomize teenagers to toking or not. But a technique called instrumental variable analysis may hold the key to determining causality in this situation. Take a look at my full blog post, which is hosted here at MedPage Today. For the video version of this post, click here. The public attitude towards marijuana is changing. Though some continue to view the agent as a dangerous gateway to harder drugs like cocaine and heroin, increasing use of the drug for medical purposes, and outright legalization in a few states will increase the number of recreational pot users. Its high time we had some solid data on the long-term effects of pot smoking, and a piece of the puzzle was published today in JAMA internal medicine. Researchers leveraged an existing study (which was designed to examine risk factors for cardiac disease in young people) to determine if cumulative exposure to marijuana was associated with impaired cognitive function after 25 years. Note that I said "impaired cognitive function" and not "cognitive decline". The study didn't really assess the change, within an individual, over the 25-year period. It looked to see if smokers of the ganj had lower cognition scores than non-smokers. That minor point aside, some signal was detected. After 25 years of followup, individuals with higher cumulative use had lower scores on a verbal memory test, a processing speed test, and a test of executive function. But wait – those numbers are unadjusted. People with longer exposure time to weed were fairly different from non-users. They were less likely to have a college education, more likely to smoke cigarettes, and, importantly, much more likely to have puffed the magic dragon in the past 30 days. Accounting for these factors, and removing from the study anyone with a recent exposure to the reefer showed that longer cumulative exposure was only associated with differences in the verbal learning test. Processing speed and executive function were unaffected. What you see is a flexible model looking at marijuana-years (by the way, one year means smoking one doobie a day for 365 days). The authors' point is that there isn't a kink in this line – the relationship is pretty linear. But look at the confidence intervals. The upper bound doesn't actually cross zero until five years. In short, the absence of an obvious threshold doesn't mean that no threshold exists. It is likely that the study was simply underpowered to detect threshold effects. The most important limitation, though, was that the authors didn't account for age-of-use on the cognitive outcomes. With emerging evidence that pot-use at younger ages may have worse effects on still-developing brains, this was a critical factor to look at. Five years of pot exposure may be much different in a 25-year old than in an 18-year old. This data was available – I'm not sure why the interaction wasn't evaluated. In the final analysis, I think we can confirm what common sense has told us for a long time. 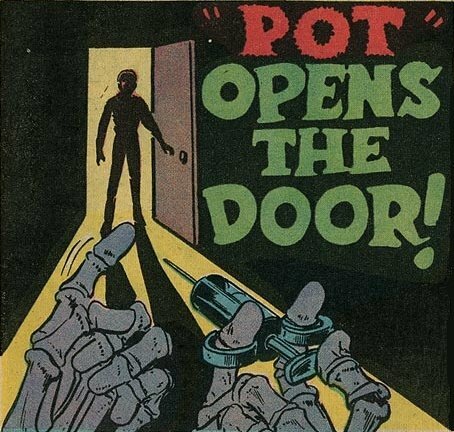 Pot certainly isn't magical. It is a drug. It's just not that bad a drug. For the time being, the data we have to work with is still half-baked.